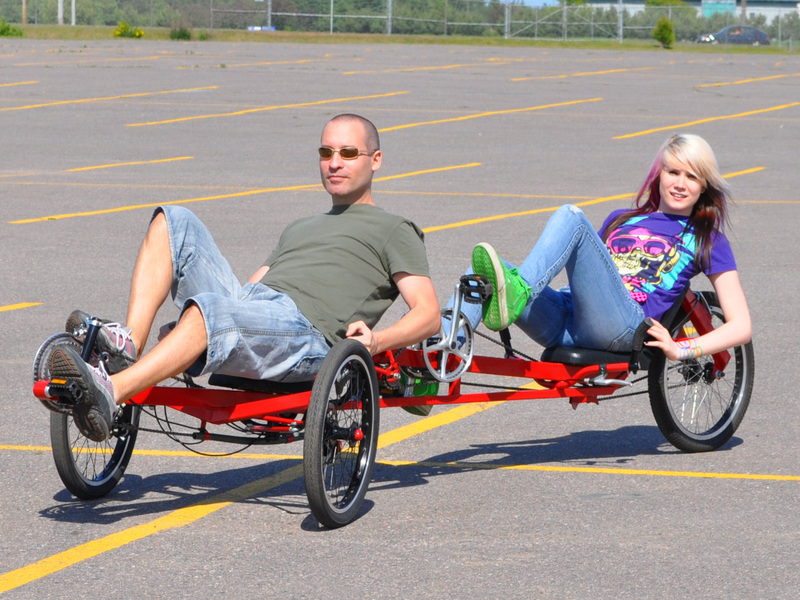 Build Your Own DIY Tandem Tadpole Style Trike. 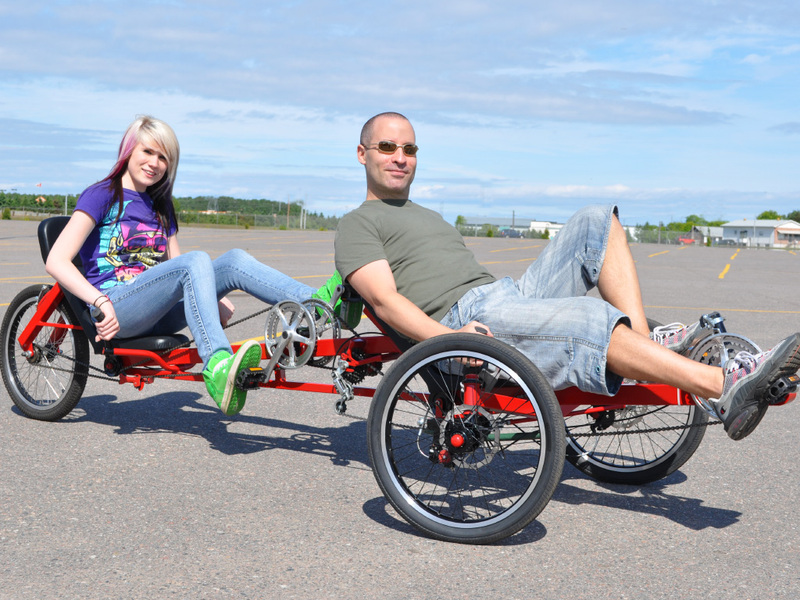 The Viking Tandem Trike delivers a fun and efficient method of travel, powered by the teamwork of two human engines. Each rider can pedal independently, making for a comfortable and relaxing ride on this great looking car alternative. 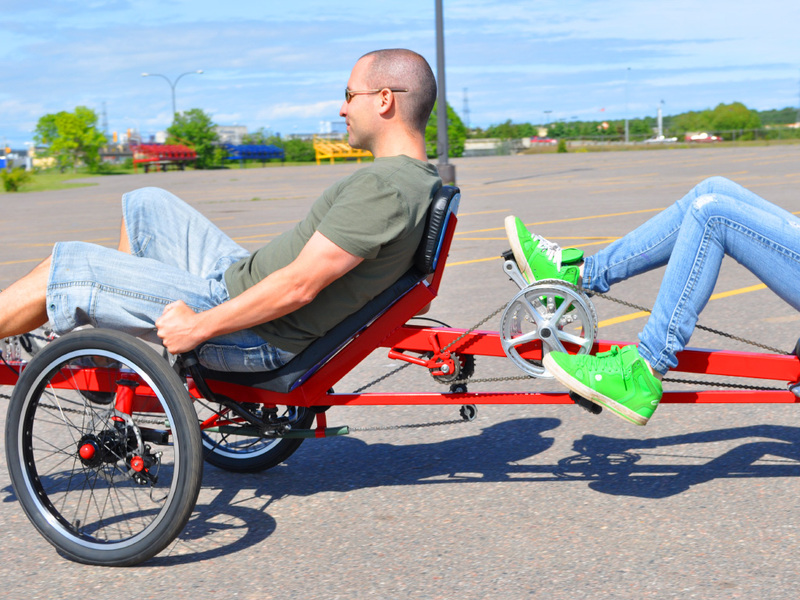 This amazing DIY Tandem Trike offers dual disc brakes, 15 speeds, under seat steering, and plenty of room for cargo capacity behind the rear seat. A Tadpole style trike refers to the configuration of two wheels up front with one wheel in the rear. Since the front wheels are behind the cranks, this type of trike can be made shorter than a Delta style trike, which has the front wheel ahead of the cranks. You Only Need Basic Parts and Tools to Make This. We design our plans so that anyone with a desire to build can make their own DIY trike for minimal cost. Every single step of the build is shown in great photographic detail, assuming that you have only the basic tools such as a hand drill, angle grinder, and basic welder. Only common bicycle parts are used, and there are no machined or expensive parts required in the steering or transmission. Using inexpensive square steel tubing, you can easily create this DIY tandem trike in your workshop using basic hand tools. All of the transmission components can be purchased at a bike shop or taken from recycled bicycles. Smooth Riding and Comfortable Reclined Seating. The Viking DIY Trike is made to be a replacement for your SUV, trading the high cost of gas for some fun outdoor exercise. With under seat steering, you have nothing to obstruct your view, and the handing is responsive and stable at any speed. The independent tandem transmission allows the captain to stop pedaling while the stoker keeps on going, allowing a new level of tandem teamwork. The independent tandem transmission does not require any specialized or machined parts, just commonly available bicycle components. Most of the required parts can be salved from old bicycles or purchased new from any bike shop. Looks Good, Rides Great, and You Built it! This trike is an attention getter, and it feels great when you can proudly proclaim that you built it yourself. 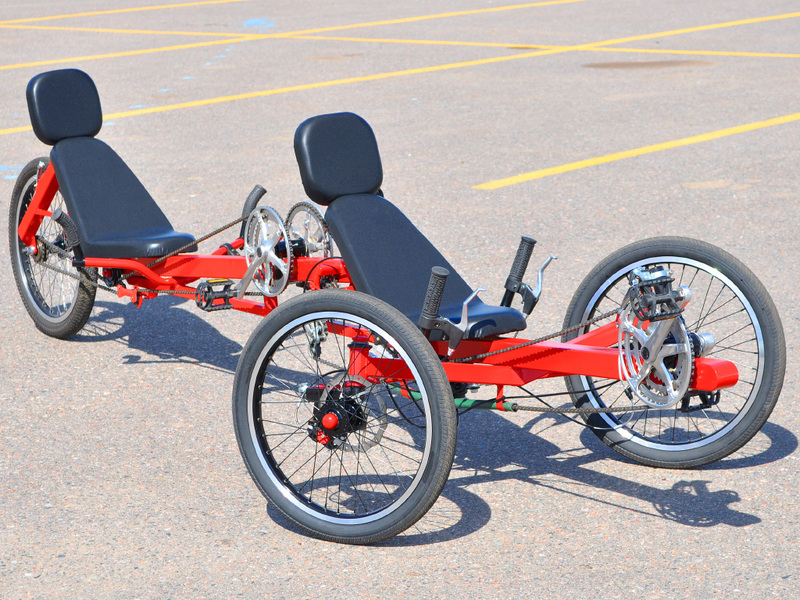 Commercially available tandem trikes are worth thousands of dollars, but you can build your own DIY tandem trike for the cost of the gas you will save by leaving the car in your driveway more often. Trikes are stable at any speed, so you can blast around corners, ride on loose gravel, or even ride in the winter. The steering components are highly detailed in the plans, and only require basic hardware store parts and steel tubing to create. All transmission and brake parts are standard bicycle components, and can be sourced easily. 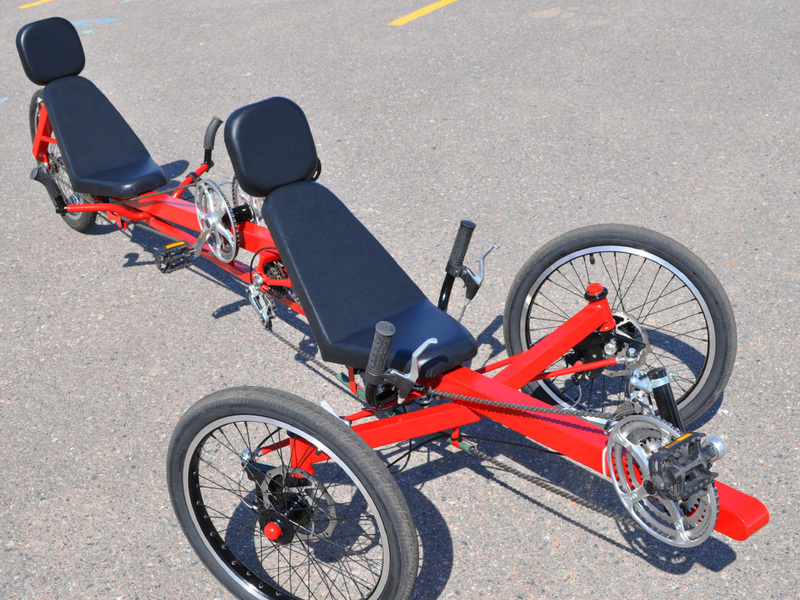 This Trike is a Great Base for a Faired VeloMobile. For those serious about freedom from petrol power, this trike would make a great base for a full or partial fairing, creating a true alternative to the automobile. The Viking DIY Trike also offers plenty of room to add a power assist motor at the rear or as a center mounted mid drive system. Having an aerodynamic seating position as well as the power of two sets of legs on one frame means that this trike is a very efficient commuting vehicle. To occomodate riders of all sizes, the Viking DIY Tandem Trike offers dual sliding bottom brackets, allowing the riders to place the cranks any place on the frame to suit their leg lengths. Adjustments can be made easily with just a wrench. The Captain Has Total Control of The Vehicle. All shifters and levers are withing easy reach of the captain, so the trike can be piloted by a single person if required. Dual front disc brakes with the addition of an extra rear brake allow for plenty of stopping power when city riding or coasting at high speeds down hills. There is plenty of room in this plan for modifications and experimentation, so you could create your own one of a kind tandem velomibile. Our plans are detailed in such a way that anyone can follow along, even first time builders. We don't do blueprints, we do highly detailed photo instructions that show how and why things are done rather than just handing out a complex "cut here" type of list. Enjoy a Relaxing Ride While You Socialize. You won't lose track of your riding partner on this trike! 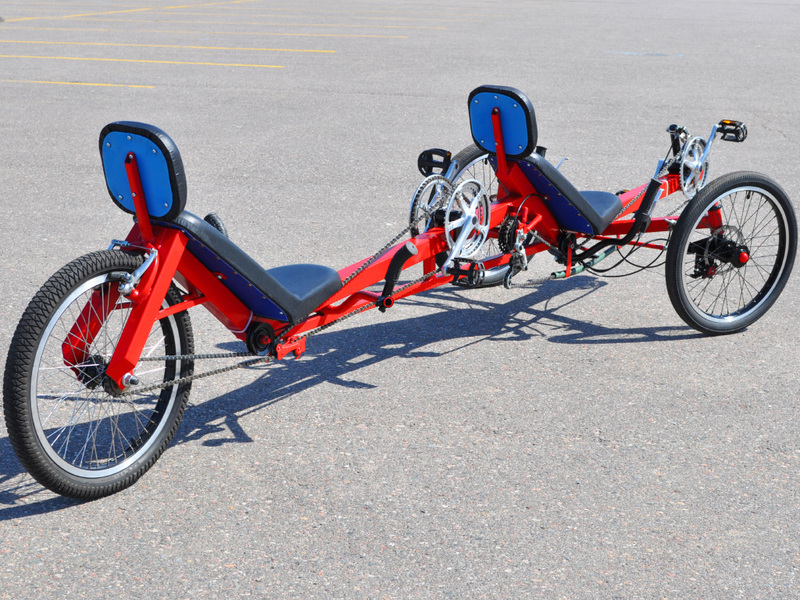 Enjoy a relaxing commute out in the country on this silent running tandem trike. The rear transmission is easily adaptable for those with special needs as well, and since the cranks are independent, the captain becomes the primary source of power. If you are a Lone Wolf looking for a robust cargo frame, then just leave out the stoker's seat and install a large cargo bay for a truly versatile load hauling trike. 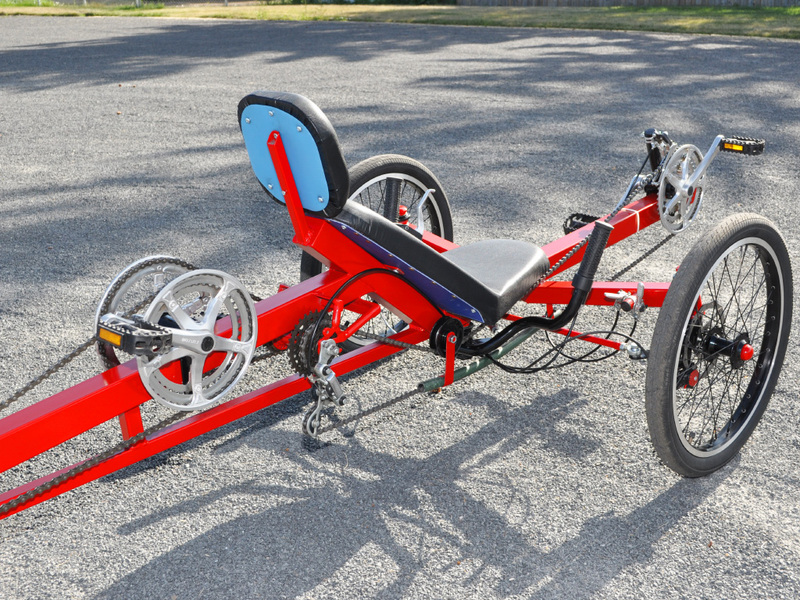 The Sociable Viking Tandem Trike can handle a large amount of weight, and is shown here with 48 spoke BMX wheels. You can easily modify the frame and components to suit your requirements as you follow along in the plans. Get a Great Workout While You Save a Bundle in Gas! 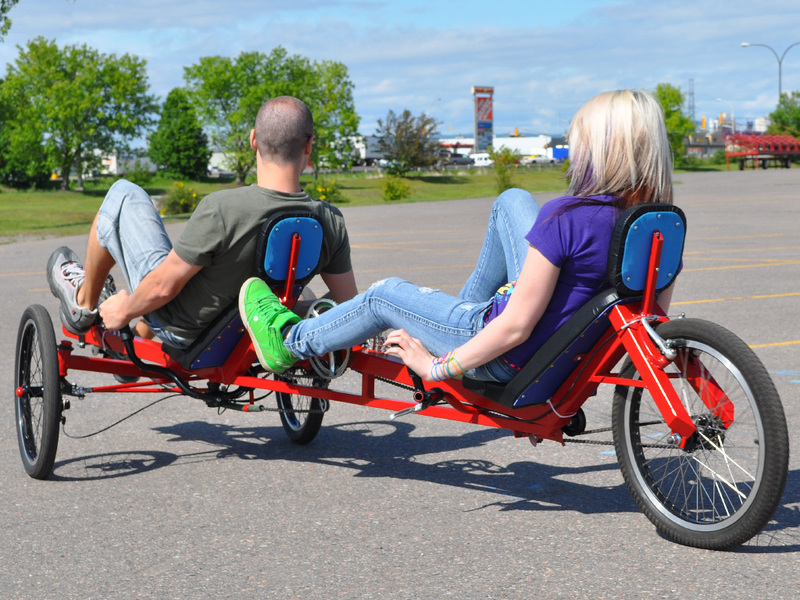 For the cost of a few tanks of gas in your SUV, you can build your own amazing DIY Sociable Tandem Trike. This trike is designed for a lifetime of service, offering the benefit of a healthier lifestyle and satisfaction of building something yourself. You can easily add a rear hubmotor to give your trike a boost of electric power when you need to tackle a huge hill or make that long commute in good time. in this fast paced age of little exercise and heavy dependence on petrol fuel, the Viking Tandem Trike is a great escape that you can build in your spare time on a reasonable budget. Get out with your partner and once again enjoy a quiet and relaxing human powered adventure.